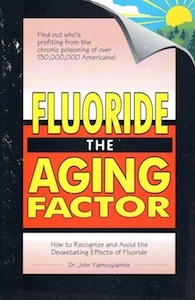 “Fluoride, the Aging Factor” will provide you with the compelling up-to-date evidence showing how fluoridation is chronically poisoning millions. Most importantly, it wilI tell you how you can help turn things around and make this world a better place to live. Dr John Yiamouyiannis shows why many of the professionals, organizations, and agencies we have relied upon for health information and protection from toxic substances, actually promote the addition of fluoride to public water systems - and why they campaign to stop the removal of fluoride from the drinking water, even in areas where they admit that it is having harmful effects. You get an inside look at the crooked bureaucrats, politicians, and businessmen who profit from human misery. You also get a glimpse at the long list of people, who risked their jobs and careers to get the word out to you that fluoride and fluoridation is taking its toll in human health and life.